I have tried and tried to write this post for days and it just wouldn’t come. Finally, my brain and emotions have decided to work together and produce the words. As I prepared for a new year in December and have settled into January, I’ve thought about my plans and priorities and everything in between. And as I thought about the blog, I kept thinking about how much I’ve failed. When I got married last year, I had so many plans for all posts I’d write, the projects I’d do and all the pictures I’d share. And true to form, I didn’t accomplish any of the things I set out to do. Don’t get me wrong, 2017 was full to overflowing, full of challenges and travels and adventure – God was so very good to us in our first year of marriage and I’m extremely grateful. My disappointment is in myself not in life. In the midst of the shoulda, coulda, wouldas is this overwhelming desire to do better. Isn’t that what we all feel at the beginning of the year? To do better than we did last year? I mean otherwise, what’s the point? So I decided to choose BRAVE as my word of the year. Brave because it’s not what I am naturally. I love my cozy comfort zone! It’s familiar and safe. But it’s constantly fighting with my dreams. It’s been said that if your dreams don’t scare you, they’re not big enough. Well what happens when your dreams are so big and scary they paralyze you? My life happens that’s what. So I choose to be intentionally brave – to step outside of my comfort zone, put on my big girl pants and actually try for the things I’ve dreamt of for years. But sometimes bravery doesn’t mean chasing big dreams. Sometimes it means simply facing your very own personal weaknesses and refusing to let them conquer you over and over again. Sometimes it’s fighting laziness and tackling that chore you hate. Sometimes it’s shutting your mouth and not pushing your point, trusting that God’s going to take care of it, your job is just to not let your temper run away with you. Sometimes it’s giving much with the full knowledge that you may get nothing in return. Sometimes bravery is training your self to be and do better than you’ve ever done before. By God’s grace and in His strength, I plan to do just that. So with 2018 in full swing, I’m going to share some of my plans for 2018 in my life and here on the blog. I don’t think there is anything wrong with aiming high but I have a habit of not being realistic with my goals, piling my plate high, losing track, skipping days and forgetting what the heck I was doing in the first place. No more. I’m going to be super easy on myself and set realistic goals and pursue reasonable projects. Failing at something doesn’t mean you’re a failure however, I’ve sat on this merry-go-round of unreasonable expectations > not meeting them > feeling like a failure > setting more expectations > not meeting them > feeling like a failure > being too scared to keep trying. I’m seeking a balance between giving myself some good solid wins while still keeping my expectations realistically high. It’s a tough balance but so needed! I don’t think I have ever finished any of the reading challenge I have hosted. I think they are fun and awesome but as much as I have fought it, I cannot keep up. It’s a combination of pressure, the season in my life, and the need to overhaul the organization in my life. I saw my stats rise around the first few days of the year. Bookworms are looking for reading challenges to add to their list. Unfortunately I’m going to give myself the gift of no and not host anything this year. As much as that’s really sad for me, I cannot tell you how freeing it feels! At least for the first 6 months of the year at least. Y’all I have never completed one of these either – #Write31 Days in October last year being exhibit A. I’m not currently capable of doing them! And I fight this every year! Another gift of no – and man it feels amazing! Y’all, I’m so proud of myself! I set up my editorial calendar in my Big MAMBI Happy Planner and I LOVE IT!! I’m planning my posts a month out so I can stay organized and, hopefully, more consistent than I’ve ever been. This is my big project this year! I’ve been wanting to do videos for a loooooong time and have never had the guts. No more! I’m doing this! Just posted my first planner vid earlier this morning ( a day late but whatever!). It’s not perfect and makes me cringe a bit but it’s D.O.N.E.! I officially crossed over into the amazing world of essential oils last year and I’m telling you – it is a lifestyle my husband and I are super stoked to dig deep into! We love our oils and are learning so much about all that they are capable of doing. Incorporating them into as many aspects of our lives is definitely a goal for the year! On that note, I’ve been saving recipes and DIYs for laundry detergent, hand soap, facial and body products, and household cleaners. I really want to start making my own household products and eliminate as many chemicals from my home. As diets go, we don’t eat terribly. But regardless, we need to eat better. Which means I need to be more intentional about finding great recipes to try and adding them to my personal repertoire! Steven and I have decided to be more intentional about dating once a week. I’ll be posting about that tomorrow :). We have also gotten really lax about meeting once a week to talk about life, plans, and finances so we need to get back in that habit! I’ve been extremely weak in this area for too long. I’m going to get into the Word daily, be more intentional about my prayer life, do scripture writing and read books to strengthen my faith. I don’t give God enough of my time and attention. That ends now. Not having a 9-5 or being in school for the past year has proven challenging in ways that I didn’t want to admit. It’s very easy to not really take care of myself when I don’t necessarily have to be anywhere on a given day. But I need to stop neglecting myself! Hair done and face moisturized if nothing else! I’m telling you, it’s so easy to plop myself at the computer first thing in the AM and let 5-6 hours pass before I ever wash my face, change clothes or try to look any kinds of decent. No more! I’m done letting myself be a slob! I need to pick and stick to some good, simple AM & PM routines to ensure that I’m taking care of my basic needs! I’ve been a really bad reader the past several years. I used to simply not have time for anything more that audiobooks on my commute. Now, it’s because Netflix binging is easier than figuring out which book to crack open. The bookworm in me is ashamed at myself but the struggle is indeed real. I’m challenging myself to a book a week. And not just an audiobook – actual pages. I have enough to keep me busy for the next several months. I need to get back into reader’s swing! The planning community is one I revel in. I’ve been a planner girl for a good long time and this year, I’m going to be more intentional about sharing what I’m using, trying new things, and staying on top of my lists and schedules. I’m a great believer in life-long learning. I want to learn some new things this year. Not quite sure what but I’m working on a short list :). The pressure to perform or complete tasks and projects perfectly is debilitating. So I’m giving myself grace to just do what I can as I can. My posts will be just as flawed as they’ve always been – there will just be more of them, Lord willing! I just have to remember that DONE is better than PERFECT and I just need to be brave enough to hit publish, brave enough to speak up or stay silent, brave enough to ask for help, brave enough to let God lead, brave enough to not be in a hurry and let the process be what it is – a process. 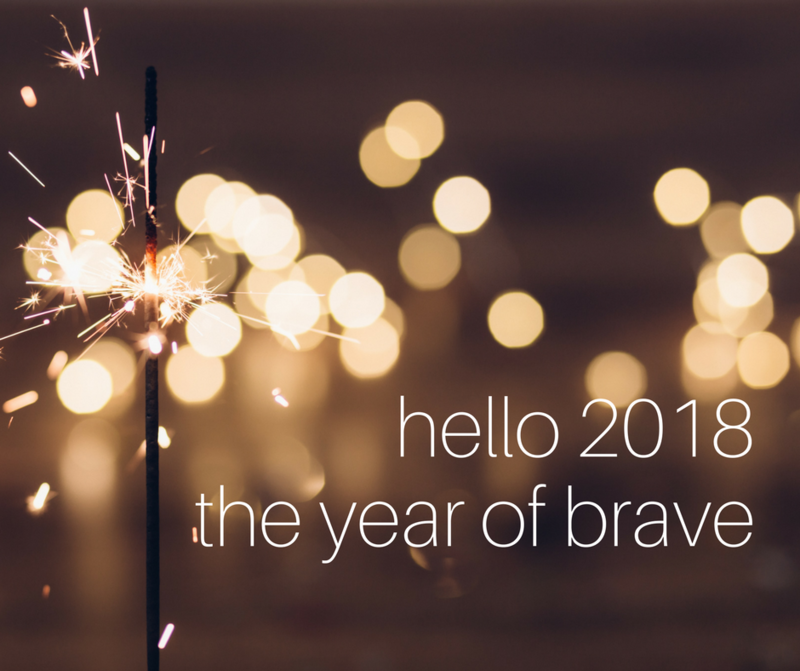 This is my year of brave and I’m grateful for it.